The hosts of this apartment, a family couple with two daughters, are passionate about art and their strongest desire was to surround themselves with artworks and extremely beautiful furnishing. At the same time they were dead against a pompous and ostentatiously luxurious interior. What they wanted was injections of bright colors, fashionable elements and family coziness. A couple of professional designers were hired to implement all these ideas in reality. For a start, the plan of the apartment was changed. The living room, kitchen and dining area were brought together in a single open space so that the family members could invite their numerous friends. But privacy of each inhabitant was also kept in mind. For example, the master bedroom was equipped with a bathroom exit and a walk-in closet; so, the hosts got a tiny sweet world of their own. 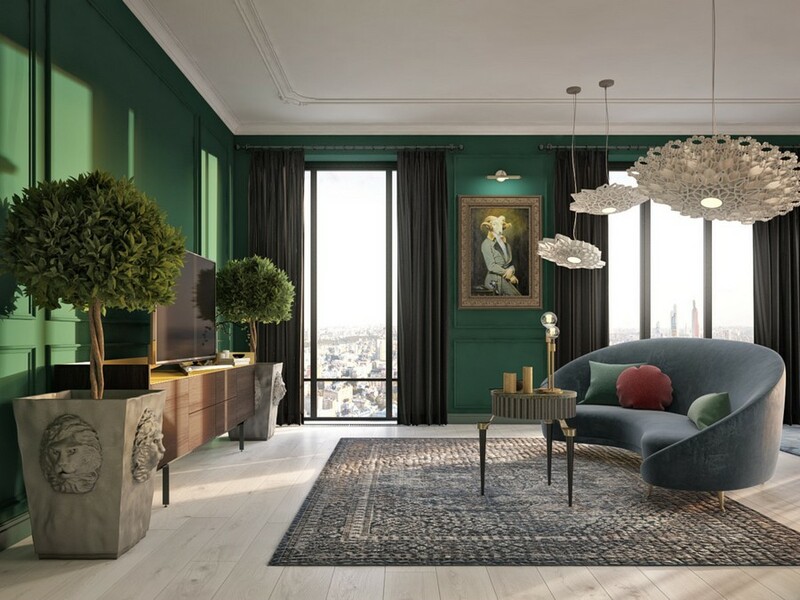 As for the stylistic concept, it was determined to base the interior on classics, but with the addition of elements that seem absolutely hostile to it: such as contemporary-style furniture or so unhackneyed colors as black and dark green. The dark background appeared to be a win-win solution for expressive pieces of furniture and art, and this home, just like it was supposed to, gradually transformed into a mini picture gallery. This entire space shares a common dark green wall décor complemented with black curtains and window frames. To soften this pretty “heavy” background the ceiling and flooring were made white. The walls are adorned with artworks in massive frames. Though this is classics, it’s spiced with a note of irony, since the portraits depict…animals instead of people. 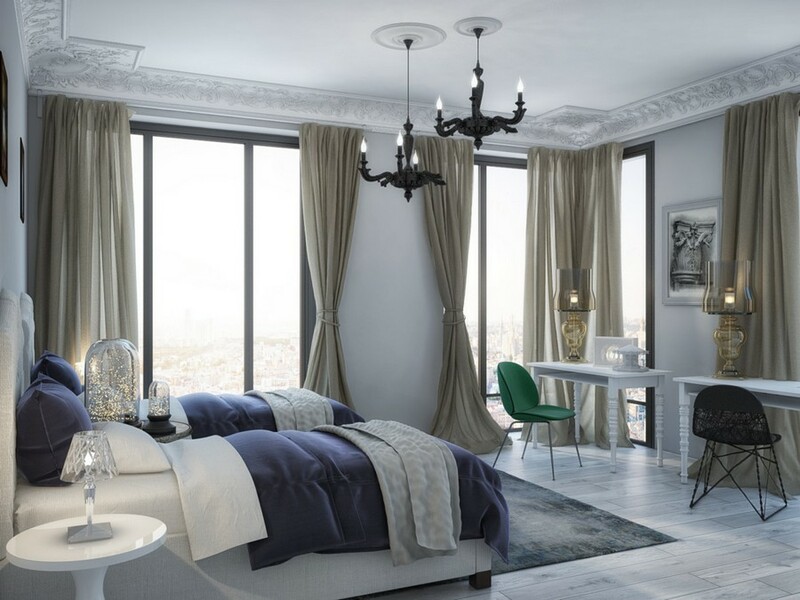 This way the authors of the project showed their ironic attitude to pure classical-style must-haves. The pictures are matched by bespoke furniture, for instance, a hand-crafted coffee table. Big indoor plants add visual symmetry to the room, and this is a tribute to classical style. In a word, there are many pieces in this space that deserve a special mention. 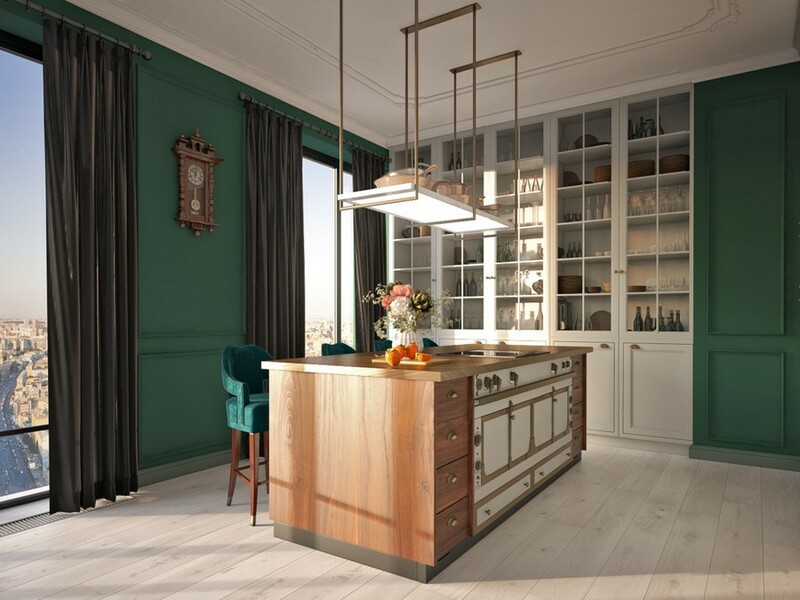 One of them is a kitchen island quite unexpectedly displaying a bunch of appliances in retro style, which makes the kitchen a cozy and homey nook. 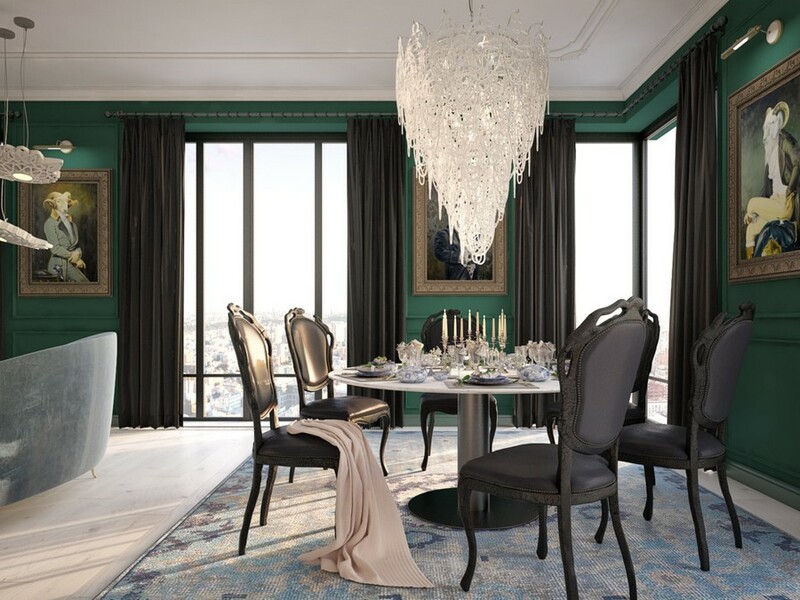 An absolutely opposite impression is made by a sophisticated and elegant chandelier in the dining zone that almost kills you with its beauty at first sight. Afterwards your eyes are likely to catch the black chairs designed in pure classical style, but with a touch of …charcoal. 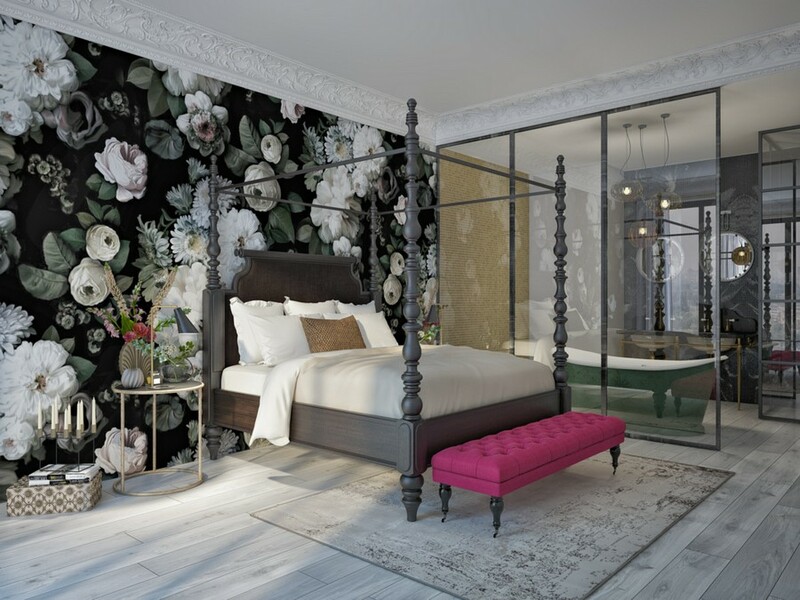 The following room is the best illustration to tips on using floral pattern in interior design: the authors used it for accentuating the wall behind the headboard. Dark hues create a stunning background for airy large-scale white flowers, and the entire composition blends perfectly with classical moldings and carved woodwork of the bed. This is one more joke the designers played to classical style. But what deserves a special mention here is the bathroom. Being separated from the bedroom with just a glass door it almost became an integral part of it. Besides, the authors used the same flooring materials for both rooms to enhance this feeling. 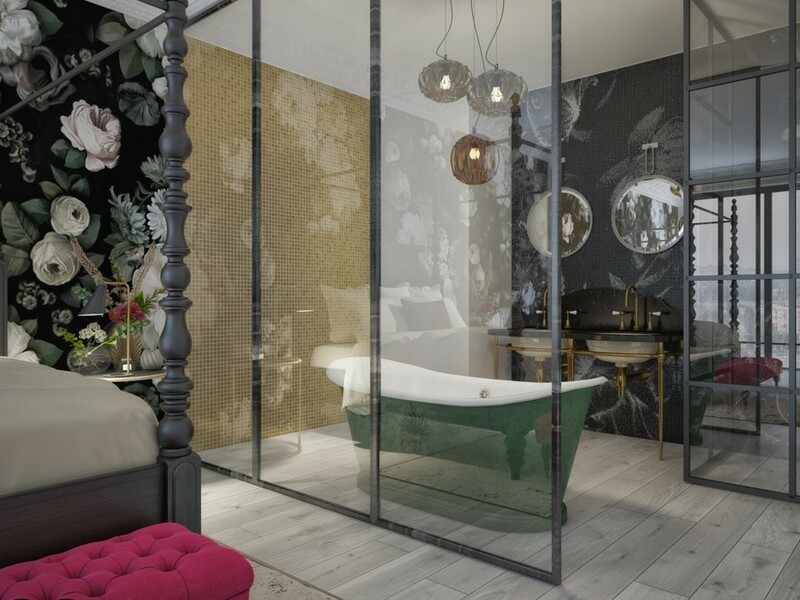 The dark green color of the bathtub gives tribute to the rest of the rooms in the public space. The wall behind the sinks is emphasized with black mosaics and the role of color injections is played by brass frameworks of vanity units. 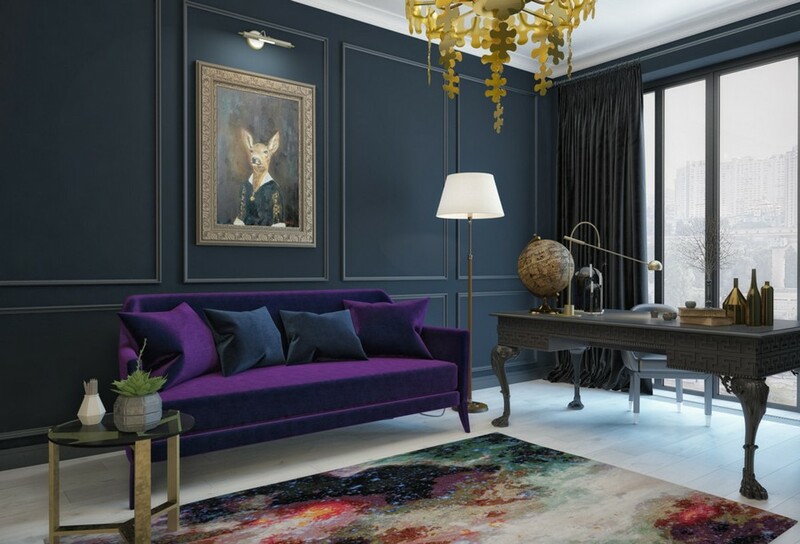 A purple velvety sofa and a rug with some space print unexpectedly break into pure classical finishes of the room. The same effect is produced by an ultra-modern puzzle-shaped chandelier, which also ironically fit into this room’s interior so well. In the kid’s room it was determined to do without any original interior solutions, and hence its color scheme appears to be absolutely contrasting to the rest of the rooms – it’s very light and predominantly grayish. However, this room couldn’t escape a touch of designer’s humor too: chandeliers from the same collection as “charcoal” chairs that we saw in the dining room are hung at different heights!